This is Berk, and we’re back to witness the young Viking Hiccup’s new adventures as he ventures out to discover the unknown; but together with Toothless and Astrid, he runs into more than just a little unpleasant people, and is desperately trying to keep the dragons safe even when uncovering an enormous secret. How to Train Your Dragon 2 brings us back to the village five years after the events of the first movie had taken place, with a completely changed Berk that accommodates all sorts of dragons and has them live in unison with the humans. And who wouldn’t want to have dragons around? Whether for games or helping with work, or simply to cuddle, every dragon has its rightful place in the village, and all should be good for Hiccup, who started out as a loner in the first movie. Except it isn’t; despite the acclaim and respect that he has now gained, he is still a bit of an oddball and, really, would just like to be left alone to explore the parts of the world still unknown – an opinion that clashes quite heavily with his enthusiastic father Stoick, who’d simply like to see his son rise to his rightful place as chief. But of course that’s not all, and the village of Berk soon faces another threat, one that seeks to diminish both them and their dragons: an insane man called Drago Bludvist. While the first film in the trilogy was quite exciting, too, this one might just be able to exceed this a little more; it is quite different seeing that all of Berk has accepted the dragons and that life is good, only to be shattered to pieces. 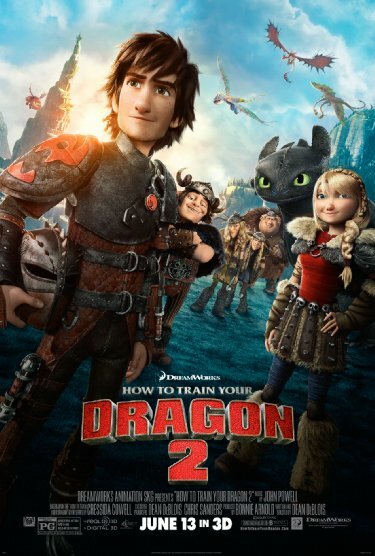 While the first movie centred largely on the village being the ‘bad’, unaccepting ones, with especially Stoick as the unmoving rock in his hatred of dragons, this movie presents an entirely external threat, even more frustrating because of the first movie’s successful resolution: because not only the humans are the problem, but Drago Bludvist is leading a dragon army to destroy them all through both force and mind control. Yet, the movie isn’t entirely shocking or devastating; it is still hilarious, maybe even more so than the first one, and the cinema was in stitches more than a couple times. But there were also a few times where you could hear quiet sobbing every other seat – including mine. It is admirable, then, that despite all the fun, the movie manages to take such an abrupt turn and plays with your emotions a lot. We rejoice and suffer together with Hiccup and his people, and wars do take their toll; but most importantly, it is interesting how the movie still relates to the real world: indeed, if the ones in control are bad, where does that leave the rest? Although not recognisable to a child, I’m sure no teenager or adult will have many troubles relating the events to current or past political situations, and it is here where the deeper message of the film lies, and conveys that surprisingly well without becoming obnoxious in doing so. And of course the familiarity with the characters and the story makes this more efficient as well; most will remember the first film, and somewhat care about certain characters. All grown up – or are they? But despite this political message, the film also conveys a more personal one, of course, especially in the character of Hiccup. Now an older and much changed boy, he still essentially remains the awkward boy from the first part, and his main personal struggle is finding his identity like a typical teenager. Who is he, and what is he supposed to do? While his girlfriend Astrid (and the two do present a really sweet couple, very much at ease with one another and quite a bit more mature than in the first film) seems to have herself figured out, Hiccup hasn’t. His personal dreams clash strongly with his father’s ambitions, and he is unable to find a way to combine them until he finds a likeminded soul– but well, you’ll have to find that one out for yourself, and it’ll definitely be worth your while. The visuals may be a little awkward at very few times, but that’s easily overlooked in the face of – well – dragons. And if you need more while waiting for the next film, go ahead and check out the audiobook amazingly read by the legendary David Tennant.